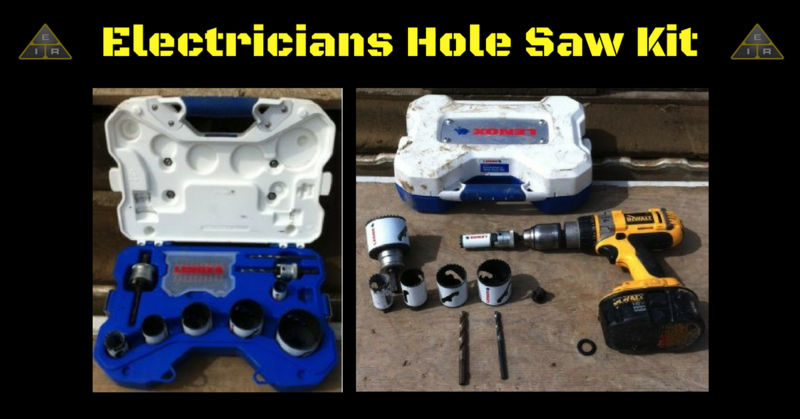 There may be many situations where you need an electricians hole saw kit as an electrician. You may have to install a light fixture, switch or security system. This means you will need to access the main wiring behind the walls. With a hole saw you can cut a clean hole without damaging the rest of the wall. In the past a keysaw would have been used, but these are less precise and making a nice hole takes a lot longer. With a power hole saw, you can get the job done in half the time. And saving time is a big part about being an electrician. A precise hole saw is also safer. You won’t have to worry as much about accidentally cutting into live wires. Drills in the most commonly used sizes – 1/2″, 3/4″, 1”, 1-1/4”, 1-1/2”,1-3/4”, 2”, 2-1/2”. 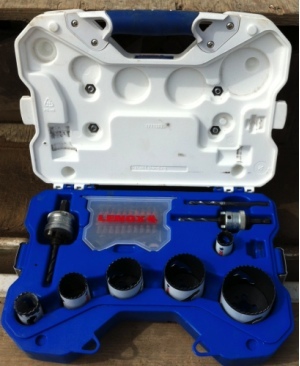 You can buy a good quality carbon steel electrician hole saw set for about $65. For around $100, you can get a bi-metal hole saw set that can cut wood, as well as metal, and will last much longer. It also includes more saw sizes. A hole saw usually mounts to an arbor, which acts as a centering guide for the blade. A high quality arbor, which costs about $35, has two pins you slide into the holes at the bottom of the hole saw to lock it into place. 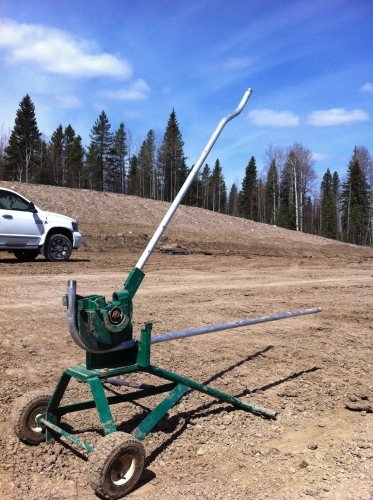 When buying an arbor, make sure to get one that fits your drill and matches with your saws. Most arbors are designed for drills with a ½ inch chuck. A word of warning! Hole saws can be surprisingly dangerous. You have to hold the drill perfectly straight and check for obstructions. The slightest tilt or hitting a nail while drilling can make the saw bind. This will cause the drill motor to violently twist in your hands. When this happens, the power of the torque could slam the drill into your face or wrench your wrist. It is hard to tell when a drill might bind. Your best defense is to prevent all possible injury by bracing yourself securely and by maintaining a solid, two-handed grip on the drill. If your drill comes with a side handle, you should definitely use it. Keep the drill straight at all times. 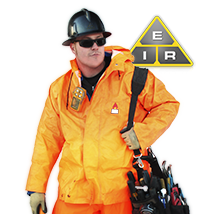 Don’t wear anything that may get caught up in the drill like jewelry or loose clothing. Be aware of the speed lock-on trigger to make sure you don’t accidentally push it while drilling. Securely clamp small pieces with at least two clamps so that they can’t spin out of control. 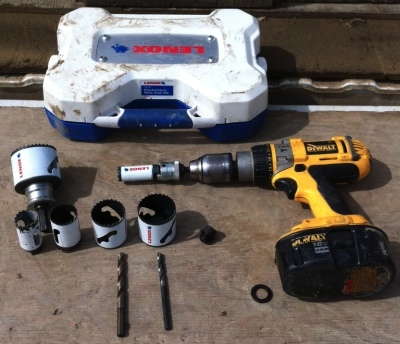 An electricians hole saw kit is basically a set of round bits capable of cutting a perfect hole in drywall, wood, fiberglass, metal, plastic and acrylic. The bit can’t do much by itself. It needs the power and rotation from a hand-held drill to cut a hole. Choosing the right drill is very important. You need one with enough power to do the job. You should get one with at least 14 volts of power, but 18 volts is better. The pilot bit guides the hole saw and then keeps the blade on course until the hole is through. Without a pilot bit, the blade would spin and wobble, leaving a terrible mess instead of a nice round hole. The pilot bit is perfectly centered in the hole saw and extends slightly past the edge of the saw’s teeth. The first step in making a perfect hole is to drill the pilot bit into the exact center of where you want the hole to be. The pilot bit anchors the blade to the object being cut and provides the saw guidance and stability. Never drill the pilot hole with the saw on the arbor, this will break your arbor bit. When you need to make an existing hole bigger, the pilot bit won’t be of any help to you at all. The pilot bit doesn’t have anything to hold on to as a means to anchor the saw blade. This makes enlarging a hole much trickier than drilling a new one. You can overcome this problem with a piece of scrap plywood and a clamp. Simply clamp the scrap plywood over the hole. Carefully mark the exact center of the hole. Set the pilot bit on the center mark and cut the hole as usual. Usually you won’t be sawing through a door, but if you are, clamp another piece of scrap plywood to the other side to prevent the wood from splintering. To enlarge a hole in drywall, or fiberglass simply use the saw that matches the hole size and place it in the saw your drilling to. This can be tricky, so great care much be taken to ensure the saw doesn’t wobble around. As with all saws, a hole saw can become clogged with sawdust or drywall dust. When this happens your drill could overheat, not cut as well and maybe even burn out. To prevent this, slow down your drilling and draw the blade out every so often to allow the saw to cool down a bit and let the dust fall off the blade. 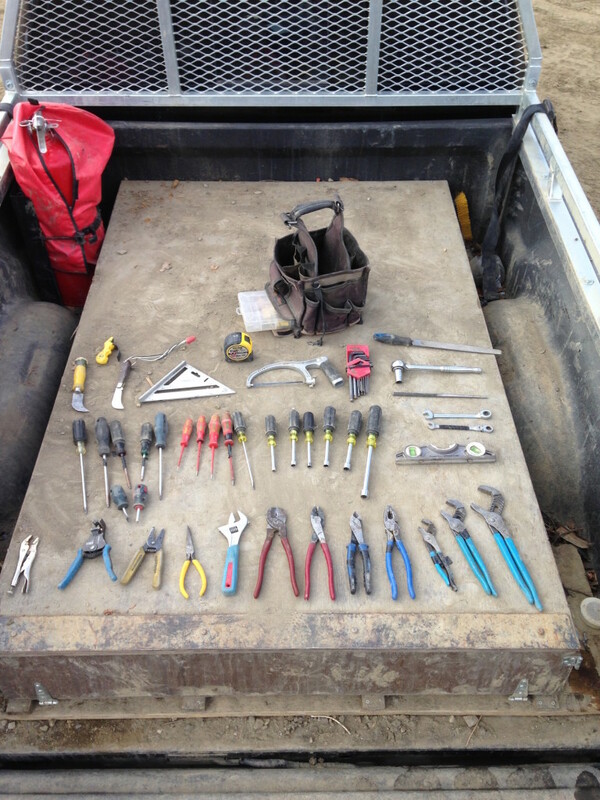 Take good care of your electricians hole saw kit and it will last you a very long time. use on a day to day basis.